Reuniting a radio and its owner is a satisfying piece of sleuthing. To find the owner of a Yaesu VX-7R handheld transceiver that has no identification and no alphanumerics programmed into it. I was sitting in the ham shack, late one evening, when the phone rang. I checked the caller ID and saw that it was a local paramedic. I assumed he wanted me to cover his shift for the rest of the evening. I was still anticipating his request when he tells me that a friend of his was bicycling north of town when he noticed something on the side of the road. It was a handheld radio with a “very long antenna and a whole bunch of frequencies that did not look familiar.” He thought it might be a ham radio and knowing I was a ham, he informed me he had turned it over to the local police department. I thanked him for the information and immediately called the police dispatcher and after she confirmed that a radio had indeed been turned in, I told her I would be right over. Upon arrival at the police department, the dispatcher hands me a Yaesu VX-7R with a 16 inch whip on it. This will be easy, I thought. All I need to do is turn it on and read the call sign on the boot-up display. To my dismay, it was a default boot-up. I told the dispatcher that it was indeed a ham radio and asked if I could have it. Without hesitation, she gave it to me. I took the handheld home, all the while pondering how I would feel if I had been the one to lose it. I knew of nobody in our area who owned this model radio. There were no markings on it and none of the alphanumeric features, which might give an indication of the owner, were used. I decided to take on the challenge of finding this unknown ham. I sat down at my computer, brought up the Iowa Repeater Council and opened a list of all the repeaters. I started with channel 1 on the handheld and documented all the repeaters that had been programmed into it. A pattern started to emerge and it appeared that the owner lived in the area of Cedar Rapids, over 100 miles away. I then searched for a local club and found the Cedar Valley Amateur Radio Club. On their website I found Bob Klaus, NØYWB, who is in charge of membership and promotion. I sent him an e-mail, detailing my dilemma, never mentioning the type, make or model of the radio. He responded the next day and said he would make an announcement about the radio at that night’s club meeting and also post the information on his e-mail reflector. Looking for another avenue, I also e-mailed ARRL® Iowa Section Manager Tom Brehmer, NØLOH, who also distributed the information. Next, I went to the “How Can We Help?” section of the Yaesu website. In the hope that the owner registered his radio and might be traced via its serial number. A quick reply from the Yaesu customer service manager indicated they do not have that information, but they were able to tell me R&L Electronics in Hamilton, Ohio sold the radio. A web search produced an 800 number and with a quick call I requested R&L Electronics to contact the owner and have the owner contact me via e-mail, should they have the information. A short time later, an e-mail from R&L Electronics indicated that they located the ham they sold the radio to, but he had sold it on eBay “several years ago” and had no idea of the purchaser’s name. Meanwhile, I had received a couple of e-mails from hams who have had their radios stolen and who checked in with me seeking their radios. I was saddened to reply with negatives. Being gone for most of the day, I came home to a phone message from another ham in my home town who believed I had found her son’s handheld. She requested that I contact her son and left his phone number, which was in Cedar Rapids. When I called, I soon realized I was talking to an old student of mine (yes, I’m a school teacher) and he immediately identified the make, model, frequencies and antenna, all in one breath. I had to stop him from continuing the description! As it turned out, he was visiting family in my town. While packing the car, he set the handheld on the roof and did not miss it until several miles down the road. The radio traveled about 2 miles before sliding off. The important thing is that the radio and owner will be reunited on his next visit to his mother. To make life easier for honest people and more difficult for dishonest people, program your call sign into the start-up window. Also, in case the battery goes dead, I recommend writing your call sign, with a permanent sharpie pen, inside the battery compartment. Most importantly — the thrill of finding the owner of a lost rig is greater than owning a new found radio. 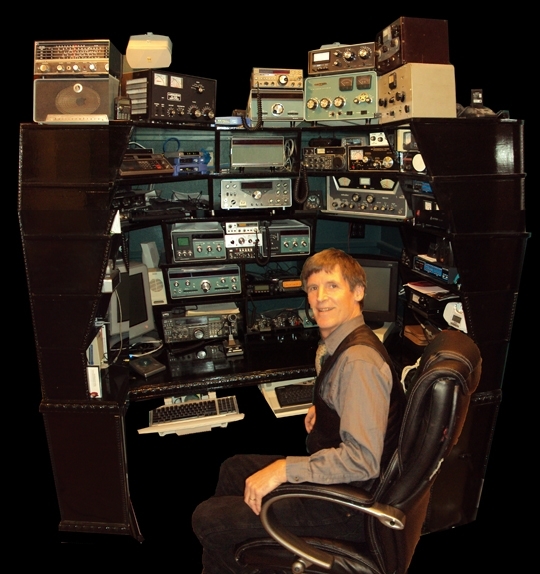 Jim Emmert, WBØURW, an ARRL member, has been a high school visual arts instructor and a ham radio operator for the past 38 years. He presently teaches at the Pella Community High School in Pella, Iowa. Jim is a charter member of the Pella Amateur Radio Club where he is the emergency coordinator, webmaster, repeater trustee and codirector for PENS (Pella Exploring Near Space). Jim prefers to spend his after school hours directly involving his students with Amateur Radio and high altitude ballooning. He can be reached at 203 Franklin St, Pella, IA 50219-1628, wb0urw@arrl.net.